Human Resources Has a Huge Role to Fulfill in Preventing Workplace Violence... and They Hold the Solutions! Human Resources Has a Huge Role to Fulfill in Preventing Workplace Violence… and They Hold the Solutions! In this edition of the Nater Associates, Ltd. Blog we introduce the value of our RAP (Robust Agile Proactive) Concept from the perspective of the Human Resource Professional in illustrating the value of Integrating, Collaborating and Coordinating (3CL) the workplace violence prevention effort through effective Leadership. Claire Knowles brings a plethora of experiences and specific expertise. We hope you enjoy the collaborative effort because we firmly believe management commitment and investment is essential in communicating the leadership role. It has often been said that Bullying happens because it can! This begs the question, Why is it not being stopped? It has been said that it is insidious – like a cancer that grows within an organization. So, why is it allowed to continue? Why is it not being addressed? by Supervisors/Managers in charge of people and teams. by Bystanders who see it happening. by those people who are targeted. by Human Resource Managers and Organizational Leaders. I recently spoke at The Workplace Violence Prevention Institute in Willingboro, NJ to address this bad behavioral topic. Human resources cannot acquiesce their essential role to stop the deliberate hurt that its taking an emotional and physical toll in our workplaces. After all, isn’t HR supposed to be advancing the human side of the enterprise? HR has the ability to enable and equip every person in the workplace (at all levels) with the tools and training to stop the bad behaviors that lead to violence. It is time to unlock that tool box! 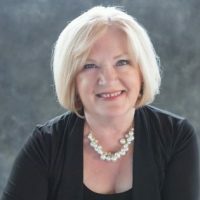 My career was spent in Human Resources and Labor Relations – 34 years in large manufacturing sites for Du Pont (untangling People problems), and for the last 15 years I have been consulting in small and large companies as well as not-for-profit groups particularly around safety, effectiveness and employee engagement. what I know is this: unchecked back behaviors in our organizations and workplaces have spawned an epidemic of deepening dysfunction and Workplace Violence. Indeed, we have an epidemic of bad behaviors happening – yet it doesn’t have to be that way. Employees should not have to dread going to work because of hostile behaviors happening in the workplace. employers should not have to suffer loss in the business sense – yet effectiveness/productivity plummets with increasing dysfunction. Bad behavior in the Workplace doesn’t start with bullying. Rather, the erosion starts when rudeness and incivility are not called out and stopped at the onset. The erosion continues when disrespect, snarking, invalidation and unprofessionalism are not called out and stopped in their tracks. Then, when bullying, (cyber-or otherwise), taunting, targeted horseplay and harassment are not quickly addressed or policies enforced, the dysfunction deepens further – and this invites even more degrees of violent behaviors into the mix – culminating in fistfights, vengefulness, mobbing and even homicide. The sad commentary is that ANY person in the Workplace, and especially supervisors and managers can and should stop bad behaviors in their tracks. Our workplaces do not have to become hostile environments. When they do become hostile, it is because Leadership has allowed this to happen. HR has the tools to intervene for the better. I’m reminded of one of Billy Joel’s song lyrics, “We didn’t start the fire… we didn’t light it… but now we have to fight it.” HR must step up. Keeping C-Suite and all levels of the organization on-board, actively engaged and monitoring progress. 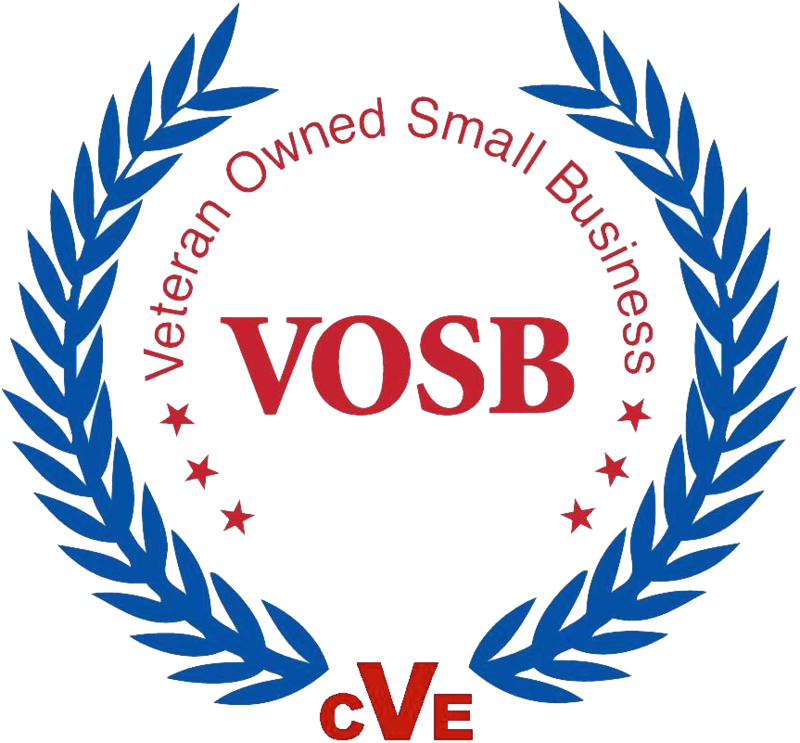 Conducting Comprehensive Training… including on Policy, how to thwart bad behaviors, handling complaints, creating top/down individualized responsibility commitments, and specialized training on Courage & Confidence, Holding Difficult Conversations, Leading Responsibly for Supervisors; EQ-capacity Assessments; Emotional Intelligence certifications. Doing on-going and integrated, facilitated Workgroup Improvement Sessions that lift up the behavioral elephants so they can be addressed; and the work-group can be the best they can be (together). Note: “HR’s role is many faceted in preventing bad behaviors leading to workplace violence. Working with Security adds another dimension for proactively addressing how to handle protective orders, retaining security when involved with terminations, having security controls in place, etc. This paper, however, is intended to address key Communication, Training & Development pieces. Why is the courage to stand up missing in our workplaces? Fear? Apathy? Just not knowing how? Why is managerial courage lacking to intervene when bad behavior and corrective action is sorely needed? HR’s role: HR has a huge responsibility to teach the tenets of desirable Workplace Behaviors, to write and enforce the policies that are essential to human interaction in the workplace. And, HR has to ensure that people who have direct reports possess the necessary courage, support and wherewithal to stand up and be counted – even when it is difficult and unpopular. The entire line organization has to have clarity on, and be committed to eliminating bad behaviors in the workplace. It is the role of HR to get the C-Suite and line organization on board. 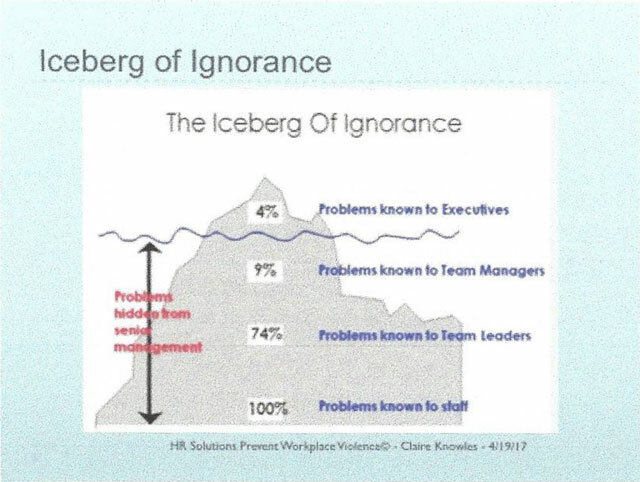 The Iceberg of Ignorance metaphor illustrates the gaps of “acknowledging what is happening” in the various levels of management – particularly regarding the bad behavior occurring in the depth of our workplaces. HR’s role: HR managers need to be educating entire line organizations beginning with the C-Suite all the way to the lowest levels of the echelon. Excuses are hollow for feigning ignorance to the epidemic of bad behaviors that are occurring. HR’s role is to step up and close the gaps of ignorance. One of the ways to do this is to insist on creating a culture of engagement wherein all levels of the organization are held accountable. There are parallels among lack of engagement and apathy, low morale, and reduced productivity. Why aren’t all Supervisors/Managers of people (at all levels) being fully trained and developed on how to muster essential courage, to hold the difficult conversations that are necessary to deal with everything from disrespect and incivility to deeper, dysfunctional workplace violence behaviors? HR’s role: HR cannot acquiesce their responsibility over this critical void in our organizations. there are specific courage-and-confidence-building training programs available, and training that equips supervisors to hold the most difficult conversations while taking ownership for holding them. Supervisors need to be able to perform under pressure – holding the conversations of responsible leadership. they need to feel the support of top management in this work. People, who are in positions of having other people report to them, need to have this specific training and be held accountable to produce positive interpersonal outcomes. HR needs to ensure this critical training is provided. Why aren’t higher levels of management ensuring/insisting that Supervisors below them step up to address the ugly behaviors that ultimately impact productivity and the bottom line? HR’s role: HR has several roles: to educate the line organization on each level’s role in preventing bad behaviors in the workplace; to ensure the appropriate addressing of all bad behavior; to monitor consistent application of policies, and to make progress or lack of progress visible. Engagement by all levels of the organization is essential for reducing the risk of Workplace Violence and bad behaviors. Just as in Safety Management, if you walk by an unsafe condition, doing nothing to correct it, then that becomes your acceptable standard. It applies to people management too. If you ignore incivility, disrespect, bullying, harassment, etc;, closing your eyes to it, essentially, you are saying that the behavior is okay. It becomes the standard you accept. The missing piece – which needs to be embedded in the responsiveness of supervisors/managers/team leaders is – Allowing behaviors to occur that hurt people is unacceptable; it must be stopped. (Period). HR’s role: HR needs to underscore how people treatment standards are set, reinforced or eroded, depending on the supervisor’s appropriate or inappropriate response. Does HR insist that supervisors courageously lift up and address the undesirable behaviors, to maintain respect and civility in the workplace? do supervisors and team managers have the wherewithal to do this? If not, why do they remain in supervisory or managerial functions? Why is HR not connecting the dots that lack of authentic engagement with people correlates to not knowing your people? And in turn, to the growth of bad behaviors, apathy among their people, and the risk of increasing workplace violence concerns. HR’s role: to know how thorough the engagement of supervisors with their direct reports actually is, and to continue to teach how to engage and hold authentic conversations. Do Supervisors know/use models or frameworks to further their engagement? Does HR set the example, regularly getting out of their offices and fully engaging with the people in the workplace, regardless of where in the HR pyramid one sits [administrative, functional, strategic] or interfacing with the C-Suite? Are all members of supervision being trained on being able to pick up the weak signals (bad behavioral cues) that are present among the people they supervise? HR’s role: It is HR’s duty to teach supervision about weak signals and patterns of bad behavior, how to recognize them and how to address them. This is basic supervisory training and development. Equally important is teaching Supervisors how to look for signs of quiet retaliation against those who do step forward courageously. supervisors cannot fall silent; they must enforce the standard that the deliberate hurting of another employee – is unacceptable. Note: ~45% of EEOC complaints last year referenced retaliation. HR needs to make sure that Supervision understands the seriousness of such charges to the business/organization. Are HR groups raising the bar by creating Respectful, Healthy, Positive-behavior Workplace policies that set higher standards for more humane workplaces? HR’s role: HR must continually raise the level of Expectation round Workplace Behaviors and the necessity to Prevent Workplace Violence of all types and magnitude. This is done through positive policy upgrades, behavioral acceptance training, and work-group communication training for lifting up the elephants that are getting in their way of being the best they can be. Are there Work-team constructive dialogs happening that allow teams to improve and develop the acceptable principles of behavior they can and will live by? HR’s role: HR, along with Supervisors, must enable work-team involvement in a workable process/format for engaging around difficult situations, i.e., bad behaviors. It is up to HR to establish an integrated, ongoing constructive dialog process. HR additional must ensure that supervisors participate and are trained to lead on-going discussions. If this is not happening, why isn’t it? Organizational assessments are also important; integrated, on-going work-team involvement is key for lifting up the elephants that are getting in the way of teams and groups being the best they can be together. it is not a one-time shot; it is a long-term endeavor, an ongoing, integrated process. To underscore this point: why is courage missing in our Team Leaders and Supervisors? They are the managers/leaders of people who are in the position to see and address the elephants that cause deliberate hurting via bad behaviors. HR’s role: HR must teach supervisors how to specifically muster the courage they need to manage people and ensure bad behaviors are checked at the onset. HR needs to teach supervisors how to lift up the elephants in the room so that they can be appropriately addressed, and not allowed to fester. HR also needs to teach people how to support each other. Just as we have layers of safety responsibilities and support in managing safety, so must we have layers of management engaged in the support for managing people and expectations of civil behavior. 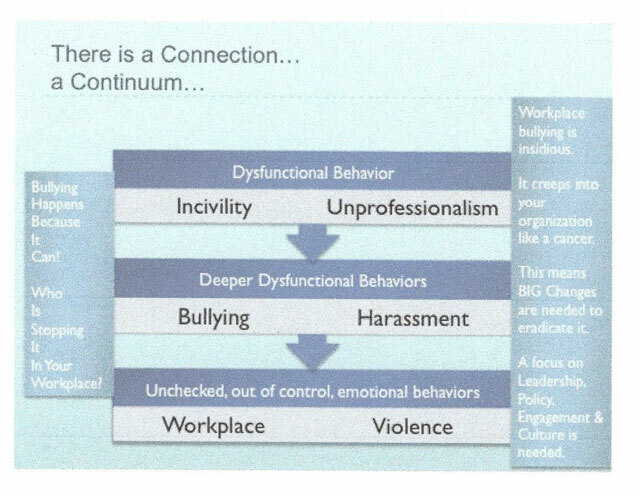 Are the specific roles of bullying (bully, target, bystander, bully assistant, etc.,) openly shared in work group training (by HR) and then specific training provided on various ways to stop bullying in its tracks? Have work-teams created their in-house mantra to collectively stop the bad behaviors among themselves – the effective words that call out the bad behavior? HR’s role: HR needs to shine a light on the ways and words to prevent bullying. Example: Unwanted, unwelcomed, and repeated jibes = Unacceptable. Work-teams need to be facilitated by HR to develop their understanding of undesirable behaviors in the Workplace and how to thwart them. Work-teams can develop their single mantra to speak openly, without fearfulness, about the behavior that is happening in the moment – calling it for what it is – unacceptable. This type of training is best done hands-on; rather than via computer-based-learning. Is HR using the tools of Emotional Intelligence to ensure that we do not hire the bad hire or that we do not promote into supervision the emotionally unhealthy bad supervisor? Are your interviewers skilled in EQ/behavior-based interviewing? Are the interviewers cognizant of attributes of emotionally unhealthy people? HR’s role: More and More, it is becoming important that HR people be Emotionally Intelligence certified. HR needs to do all that it can to prevent making a bad hire so the potential use of EQ testing for hiring and promoting should be a consideration; EQ/behavioral based interviewing skills must be sharpened. HR must be clear on the costs of a bad hire and the negative impact on the organization’s culture. Share this article with your contacts! Claire Knowles is an HR Professional, 2-time Best-Selling Author and in-demand speaker. Her book, "Can You See Them Now? Elephants in our midst", is a poignant read for addressing the undiscussables in our workplaces. Claire's independent work, along with her work with her Partner, Ritchard Knowles includes a proprietary facilitation process for engaging people in constructive dialog and problem resolution, on safety, effectiveness, employee engagement and behavior. She enjoys working with people who are committed to creating positive outcomes for the complex challenges facing them. Connect with Claire directly on LinkedIn. Exceptional post Claire on the fundamentally important role Human Resources plays in preventing workplace violence. Thank you Kathleen. Claire and I wanted to show how the integration and collaboration of effort are essential in the coordination of workplace violence prevention that starts and ends with the capability of the HR professionals. When HR discovers their contributory value, prevention efforts will be realized from the standpoint of how HR can direct the prevention effort. We appreciate your interest. Thank You Kathleen and Thank You Felix. This is becoming more and more of a problem every day! Ken Walden, thanks for posting your comment, much appreciated. The time has always been near Ken; however, the connection between the messengers and the recipients either was not timely or the recipient was not ready to receive the message. Workplace Violence Prevention is not a quick fix, it is an ongoing “process” involving multiple intervention strategies. It is not active shooter training! It is not employee training! It is senior management commitment and investment from the top down. Following the Edmond Post Office, Edmond, Oklahoma killing and wounding of 20 co-workers by Part time letter carrier Patrick Sherrill on August 20, 1986, the Postal Service was caught by surprise. It was the Postal Service and the Nation’s first ever workplace tragedy of that magnitude since then the Postal Service has had commendable success. The difference being that the Congress did not tell the Postal Service what to do. The Leadership found out what it needed to do and did it or else. Leadership makes the difference. The corporate and educational institutions have been left to their own devices reacting after workplace and school shootings and going back to business as usual. What is needed is a paradigm shift in current approach. I appreciate your input and encourage your continued input. Please pass along to others in HR.